My Blog: What a Marvelous Monday! Many months ago, when I started my Flickr account, I started browsing around in my favorite groups - the doll groups. 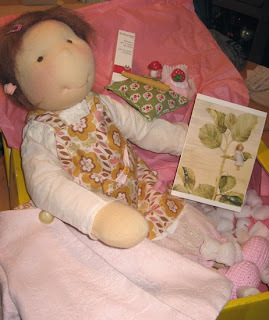 After seeing so many wonderful dolls, I came across a young lady from Germany/Sweden. Her shoppe, Froken Skicklig, her name, Juliane. Her dolls, magical; her spirit, enchanting. After many emails, a lovely friendship has evolved and I just think that gal is so sweet and talented. Not only a master doll maker, but a wonderful story teller - an artist all around. She has a DaWanda shoppe and I was so happy for her when she opened up her Etsy shoppe; giving everyone a way to be in touch with such an amazing spirit. Well, I'm a crazy doll lover and if you saw my home, you would know, I love my dolls. But it's not only the dolls that I love, it's an extension of the doll creator that I admire so much. 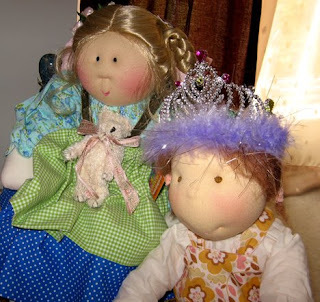 I've talked about my Little Soul dolls and their creator, Gretchen Wilson. She is an amazing woman that I've had the tremendous pleasure of meeting and speaking with on many occasions. With Juliane, I feel the same connection. Both women inspire me to look within and find the joy in creating. To find the connection between my own soul and that which I craft. They are both wonderful and it's my extreme pleasure to have reminders (their wonderful work, ie, dolls) around my home to keep me on the right path!! Below is my Alva, created for me by Froken Skicklig. You can read her wonderful story at Juliane's blog site. She's a magical little girl that I will adore, always. Here are also a few items that my wonderful Juliane included in my birthday box! 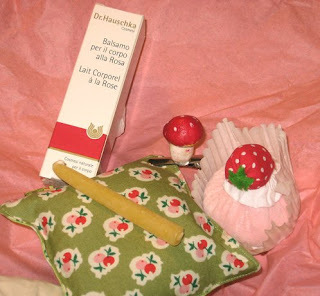 A wonderful sache, a birthday candle, a lovely little cake, and some body lotion. Here are my two gals together, Jilly, from Little Souls creator, Gretchen Wilson and my little Alva. Jilly was willing to share her tiara for this photo.